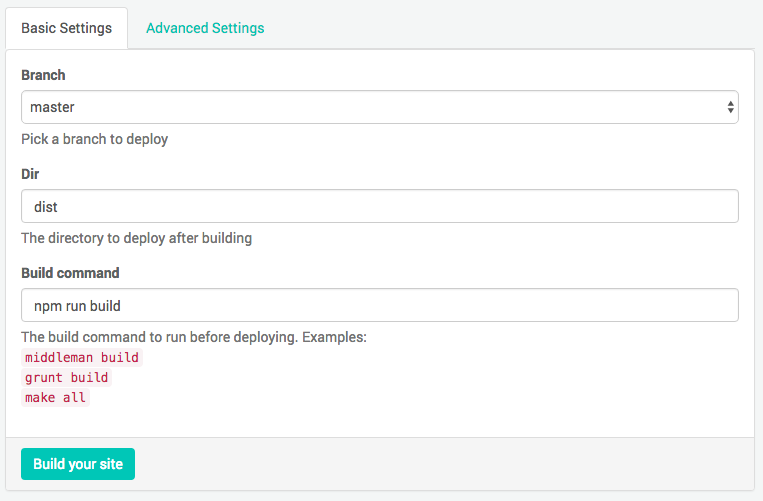 Today, we’re going to show you how to host build and host a static website using Hugo on Netlify, including setting up continuous deployment with GitHub. In this comprehensive tutorial, we will be using Victor Hugo (a continually-maintained Hugo boilerplate) to build our modern site in Go and Hugo, hosted all over the world on a CDN. To get started, let’s make sure you have all the tools you’ll need. Go ahead and download Victor Hugo here. Let’s create an About page. Put some content in Markdown format below the toml front-matter (the section marked by +++ before and after it) and then save it. Now, let’s add a new post. The new file is located at content/post/first.md. It’s just begging to be spiced up, isn’t it? *TIP: Create a few posts like this to get some content in place and see the formatting of multiple articles in lists. Now that you have some content, it’s time to display it. Hugo has a repository full of themes that you can use (or you can always create a custom theme). 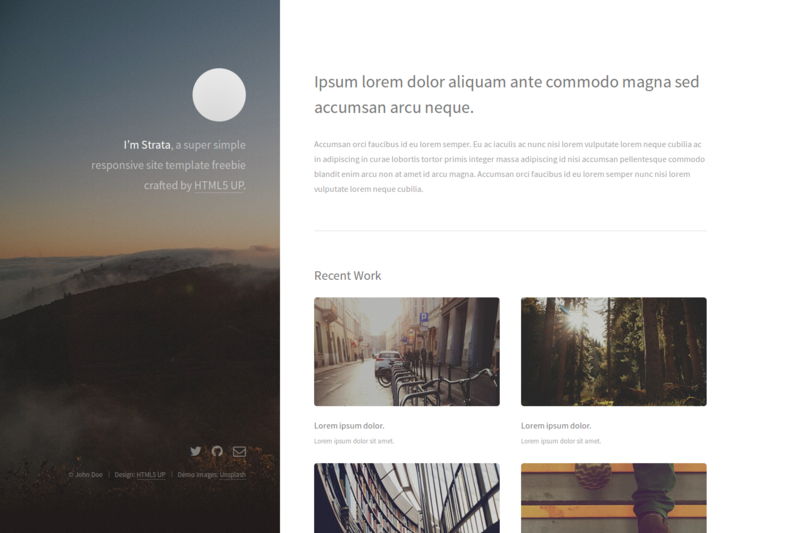 For the purposes of this tutorial, let’s use the Strata theme. Find the Strata theme in Hugo’s theme library (or you can simply click here). To avoid headaches and to make it easy to tweak the theme we are just going to download the zip instead of cloning the theme’s repo. To do so, simply click the Clone or download button then click the Download ZIP button on the right hand side of the page. In the hugo/site directory, create a new folder called themes, then unzip the Strata file into /PATH/TO/hugo/themes. Be sure to rename the folder from hugo-strata-theme-master to just plain hugo-strata-theme. Setting up your first theme. Most themes will document how to set them up in their README.md file. For the Strata theme, there are 5 main things we need to do. Then we must copy the contents of the example config.toml file from themes/hugo-strata-theme to our site’s config.toml file located at hugo/site. *NOTE: Be sure to update the baseurl variable in the config file to a relative path like below. We must update our landing page layout with the theme’s template layout located at themes/hugo-strata-theme/index.html. For your convenience, here is the code from this theme (as of 9/9/16) to replace the contents of your index.html located in site/layouts/index.html. ## This is our sample Markdown content. Repeat this draft status updating with all of the post files we created earlier (referring to the first.md and other content you may have created). This will allow you to see these articles listed on the homepage (in the “Recent Blog Posts” section) and on the “Blog” page (accessed by clicking “Blog” in the side navigation). Voilà! You should see your landing page styled to look similar to the screenshot below. While your in awe of your new landing page, go ahead and check out your new “About” and “Blog” pages too. 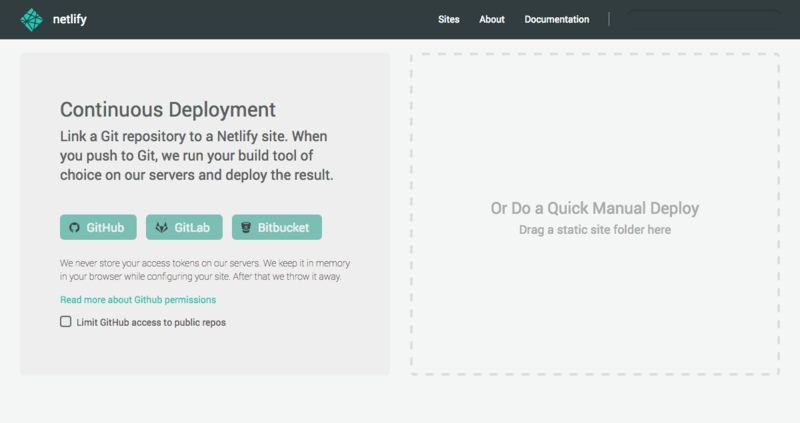 If all looks good, it’s time to push your new hugo site to a GitHub repo (Netlify also supports linking to BitBucket, GitLabs and self-hosted repos). Now that your repo is on GitHub, let’s connect them to Netlify. 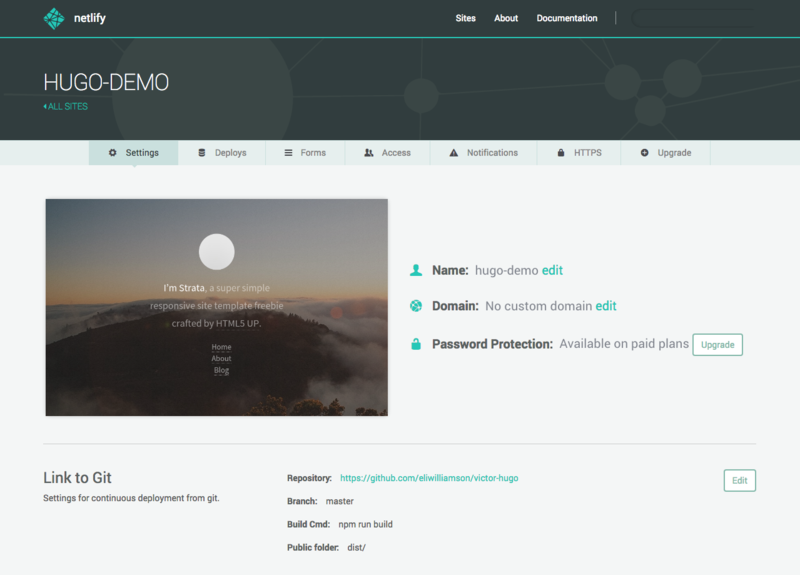 In this section, we will show you how easy it is to launch your first Hugo site on Netlify. If you are not already a Netlify user, go ahead and sign up for free here first. 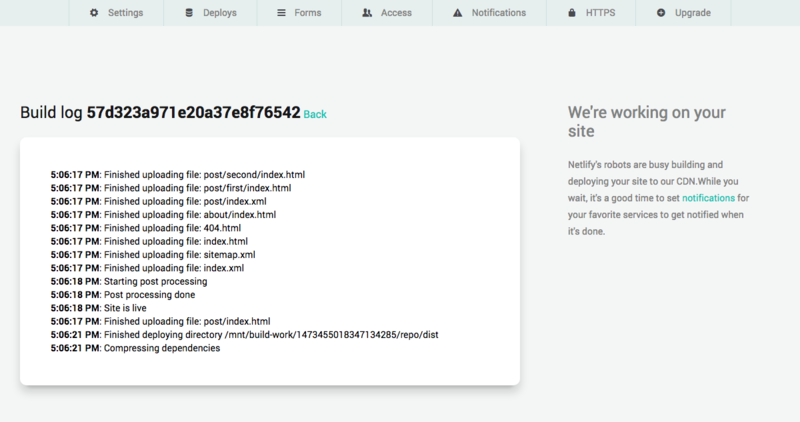 Since your repo is already pushed to GitHub, all we need to do is link Netlify to GitHub. Click the GitHub button as illustrated in the screenshot above. 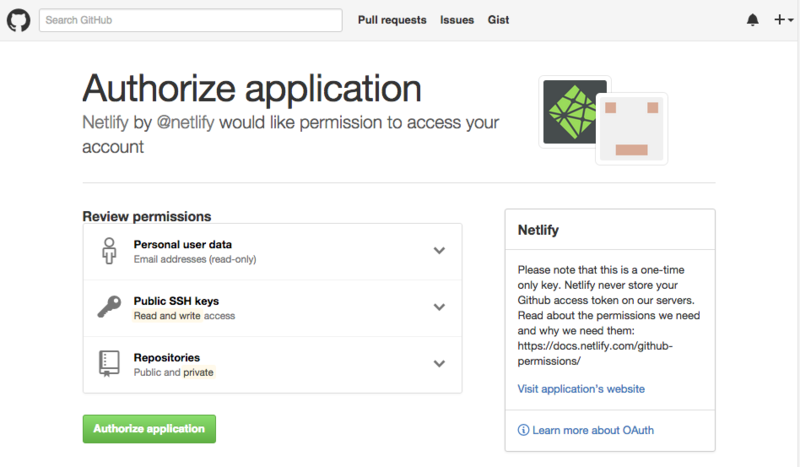 It’s time to allow Netlify and GitHub to talk to each other. Clicking the Authorize Application button will do just that. Like it says in the image below, Netlify doesn’t store your GitHub access token on our servers. If you’d like to know more about the permissions Netlify requests and why we need them, you can visit https://docs.netlify.com/github-permissions/. Now that you’ve connected Netlify and GitHub, you can see a list of your Git repos. There’s the “hugo” repo we just pushed to GitHub. Let’s select it. Here you can configure your options. Make sure your Directory is dist/ and your build command is npm run build. Then click the Build your site button to continue. There, that’s better. Looks pretty good, huh? Take it a step further and setup your custom domain (Learn how to do that here). Congratulations, you’re officially practicing the JAMstack on Netlify! RESTful APIs are great, adding them is simple too!